Gingivitis: this is the earliest stage of gum disease, an inflammation of the gums caused by plaque buildup at the gumline. If daily brushing and flossing do not remove plaque, it produces toxins that can irritate gum tissue, causing gingivitis. 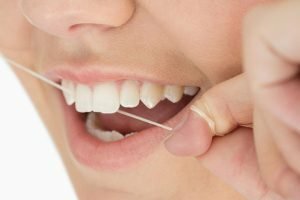 You may notice some bleeding during brushing and flossing. At this early stage in gum disease, damage can be reversed. Periodontitis: at this stage, the supporting bone and fibers that hold your teeth in place become damaged. Your gums may begin to form pockets beneath the gumline, which trap food and plaque. Proper dental treatment and improved home care can usually help prevent further damage. The only way that gum disease can be cured is through professional treatment. This does not mean that there is nothing you can do to help control it. To decrease your symptoms and reduce the chances of gum disease advancing, there are several things you can do at home. First, make certain you brush and floss at least twice a day. This will help decrease the amount of plaque that builds up on your teeth. As you may know, plaque buildup is usually the cause of gum disease. Rinse your mouth with a mouthwash that’s used to treat gingivitis. Also, and it should go without saying, you should practice good ‘normal’ dental care at home with a focus on several specific things. Use Antibacterial Toothpaste. There are also anti-gingivitis toothpastes that can target the plaque found around your gum line. Brush your teeth effectively. Make sure you brush for 2 minutes, 2 times every day. Consider an electric toothbrush that will give you a more thorough cleaning than a manual brush. Use an Antibacterial Mouthwash.Mouthwash can get to plaque bacteria that’s hiding in those hard-to-reach places. Floss daily.Flossing removes food particles that can feed plaque that your toothbrush could miss. What can Main Beach Dental do to cure your gum disease? For gingivitis, we remove plaque and tartar both above and below the gum line. We irrigate the infected areas with a rinse to flush out and kill more bacteria. We often ask to see patients about a month after initial treatment, to ensure the gum disease was effectively treated. Mild periodontitis is usually treated with a cleaning called scaling and root planing therapy. Scaling removes the plaque and tartar from your teeth above the gum line. Root planing goes beneath the gum line to clean the tartar from the root surface and make it harder for bacteria to adhere there. In some cases, we may also prescribe an antibiotic. Once the disease has advanced to this stage, you will need to return to the dentist for more frequent cleanings. Severe periodontitis often requires surgery. Typically, the pockets are deeper than six millimeters and there is permanent bone damage. Some teeth may be so loose, they can’t be saved. Your teeth may have to be extracted replaced with a denture, bridge or dental implant. Obviously, you want to avoid this with a solid regimen at home, and regular visits to your Main Beach Dental dentist! At Main Beach Dental your gum health is important to us. We provide gentle, expert care for all conditions and work to prevent disease, decay, and too many dentist appointments in the future. Our commitment to our patients is dental health for a lifetime!